At entry way...all who enter have complimented & asked where I got it. Have 2 large dogs constantly patroling the front doorway - rug holding up great - not dirty or dingy looking - had it since before Christmas (I think) - vacuums back to looking brand new. 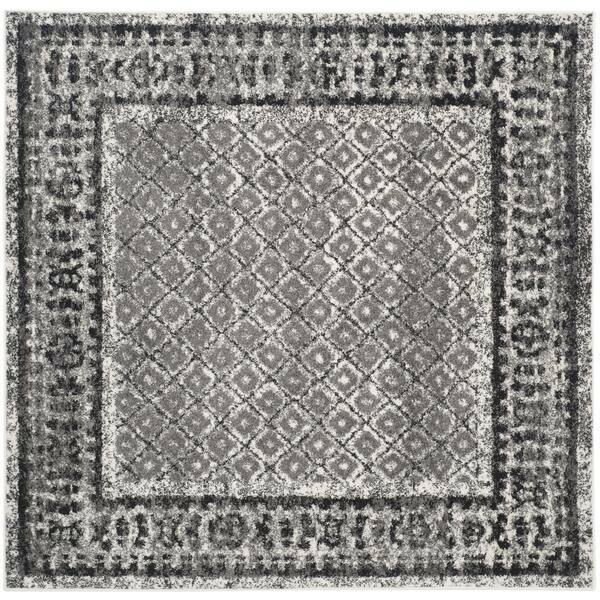 The rug looks like the picture, ivory/silver/black, and the size(4’square) is perfect for the spot I am putting it, and I trust this brand of rug, as I have other rugs from Safavieh as well. I am satisfied with this purchase! I got this rug for my daughter as a Christmas gift and she is very satisfied with it. I can't believe that it was so inexpensive! She told me that the material is strong enough to stand up to her 2 kittens. I am very pleased with this purchase! Looked so cheap. The picture makes it look somewhat handmade, but it looked like the colors/pattern was printed on. The rug is very thin and looks very inexpensive. Not good quality. Just perfect! My son wanted it for his room and he is very happy with the purchase. Great product, especially considering the price. Exact size and colors needed.